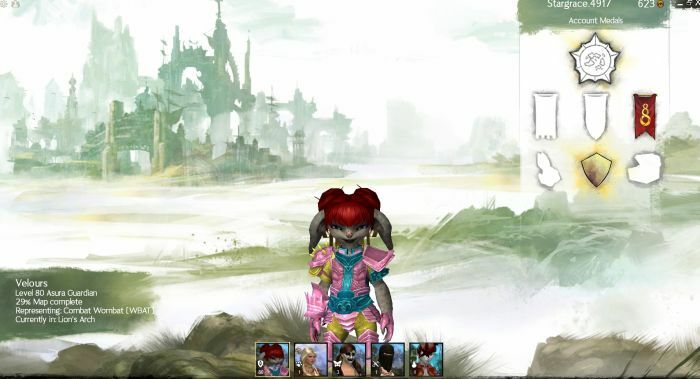 Ding 80, and 400 in Cooking / Jeweler #GW2 #GuildWars2 – Nomadic Gamers, eh! The road to 80 really is just the beginning of GW2, just like it is in GW1 (except their road is a lot shorter, it’s level 20). People can talk about how there’s no “end game” content all they want, but the whole game is end game content, especially since you level down to the appropriate level for all of it. I’m glad that I’m 80 now, and I’ve never been one to complain about lack of things to do. In fact now that I’m 80 the list of things I want to do has grown significantly. People who are used to the ‘push forward and gain levels’ mentality may not be keen on this aspect of GW2, but I’m going to enjoy it. Getting to 80 was pretty simple. I crafted for the majority of those levels, I’ve reached 400 in two disciplines, cooking and jeweler. I’m debating now whether I want to learn ALL the crafts on one character, or split them between alts. I still haven’t had any inclination to play alts. As soon as you hit 80 you learn two things that come as quite a shock. Number one, you can NEVER have enough karma. Literally. The level 80 cultural weapons are 68,000 karma each slot. The level 80 (and mind you, these are rare armor pieces, not exotic) cultural armor is 10-35g depending on the piece. There are legendary weapons in game. Each weapon requires 2 crafted components (each of those recipes costs 10g each for the crafter), along with an item that costs 200 skill points (you continue to gain skill points after level 80, you’ll earn experience as though you are leveling beyond, and it will convert into a skill point) and an exotic weapon (which is currently on sale on the trading post for about 60g). So what is next for me? I’d like to complete 100% of the map with a single character, and I’d like to be able to farm karma and gold in order to purchase the recipes needed for legendary weapons. This will all (of course) take a LOT of time. Tyria is MASSIVE. Even though I’m level 80 I’ve only completed 29% of the map. I MAY start playing an alt, casually, but again I haven’t felt a pull to play one at all, so we’ll see. I’d like the other two banners that you see on the log-in screen that indicate you’ve joined all three orders. So far I’ve just got the tapestry for the Whispers. I’m also dirt broke now that I’ve reached 80. I am not upset about that, it’s because I purchased a lot of gear and craft goods from the trade post in order to get my skill ups. Food doesn’t sell back to vendor at all, and you can’t earn any coin back by selling karma ingredients (they are bind on account) so it’s been hard to earn money back with that one. Food itself doesn’t sell for much to other players unless it’s the +magic find food, that type sells pretty well. All in all? I’m happy. Being level 80 (to me) just means that I can play the game without having to worry about whether or not a zone or dungeon is too high for me. It’s basically ‘unlocking’ the game. I would have been just as content if they had only 20 levels, too. The cultural gear and legendary items will, I would hope, be a heads-up to those who said GW2 would have no longevity due to having no end-game treadmill. That was always a crazy thing to say. GW had some of the most epic grinds in the history of gaming. The difference with GW and GW2’s grinds is that you can do them if you want, or you can do something else and not be punished by having a gimped character. In WoW terms, it’s more “Insane in the Membrane” and less “get full tier 13 raid set”. @Rakuno – I would 100% say just level at your own pace. Whether that’s fast, slow, or some where in the middle, it doesn’t matter. You’ll get there when it’s comfortable for you and the content will be there no matter what. I’ve been trying to hold on level because I wanted to play the dungeons in the “intended” levels (I put it in quotation marks since the auto-scaling makes it a moot point) and so that whatever gear I got from there would be still useful to me. But now that I read your post I wonder if this thinking of mine isn’t simply silly, if I shouldn’t just give in and keep leveling at my own pace. More levels would mean more utility skills I could buy, making me more flexible and being able to raise my crafting professions to support better my other characters and my guild mates. It would also allow me to do all the mistakes I will undoubtedly do the first time around and avoid it with subsequent characters.